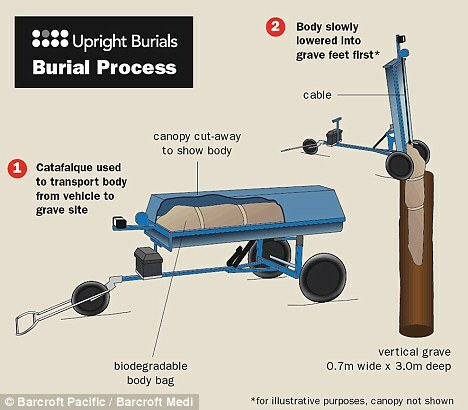 Just when you thought there were enough options for final disposition, a company in Melbourne, Australia, invents a trolley that will cart around a corpse then deposit it vertically with minimal blunder into a narrow hole. The new six feet under is ten feet deep and two feet wide; bodies are sheathed in biodegradable sacks. Not only does this make it “eco-friendly,” such Upright Burials (the name of the company) would take up less real estate in space-sore cemeteries. As it is, the burials will be performed in a designated field outside of Melbourne that, once full, will be converted back into pasture. But Mr Dupleix [the company director] believes principle rather than price is the main reason for interest in vertical plots. You know… targeting poor people doesn’t automatically make you a jerk. And if that isn’t true, then it’s definitely true that greenwashing poverty (not to mention death) is a one-way ticket to more than 10 feet deep. Posted by Meg Holle in Burial, Eco-Death and tagged green burial, vertical burial. Bookmark the permalink.